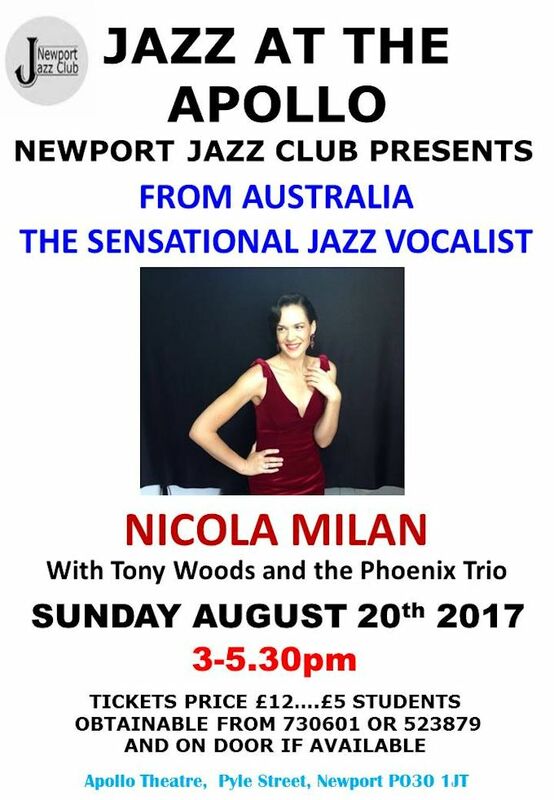 Ladies and Gentlemen – Newport Jazz Club is delighted to present one of Australia’s top jazz singers, Nicola Milan. This sensational singer will be accompanied by the Phoenix Modern Jazz Quartet that will include top jazz saxophonist Tony Woods. She will be singing standards and some of her own super compositions. Tickets have already being taken up so this concert may be heavily subscribed. Please reserve your tickets by emailing: w.g.wills@hotmail.co.uk or Tel: 01983 523879 or 01983 730601 or on door if available. Many thanks, hope to see you there!